Belgaum is the city of art and culture! The upcoming artists of Belgaum have gathered to form a dramatic movement called “Natyasutra” to preserve the traditions of Theatre. For last three years they have been organizing Theatrical workshops for new talents. Their main objective is to adopt the latest techniques and technologies used in dramatics. Bringing these efforts in the limelight we will be presenting the drama “Wedding Album” written by the well known play-writer and actor Mr. Girish Karnad. This drama is translated in Marathi and directed by eminent theatrical personality Mr. Pradeep Vaidya. Sunday 21st July 2013 at 6.30 PM. Venue: Lokamanya Rangamadir, Konval Galli Belgaum. Actors in the play: Natasha Ajgaonkar, Pranav Gurjar, Sayeli Ashtekar, Vrushali Marathe, Vijay Bhagwat, Kirti Tembe, Abhay Kulkarni, Prajakta Bedekar, Shishir Kulkarni, Sameena Mulla, Manjushri Jalihal, Ashwin, Jitendra Redekar, Tanish Ajgaonkar, Rahul Patil, Vinayak Ogale. This project is an initiative towards training of young minds of Belgaum in regard of dramatics. This project was conjured by Mrs.Swati Kulkarni. First workshop was conducted by Mr.Chinmay Kelkar and Mrs.Geetanjali Kulkarni in two sessions in January 2011. 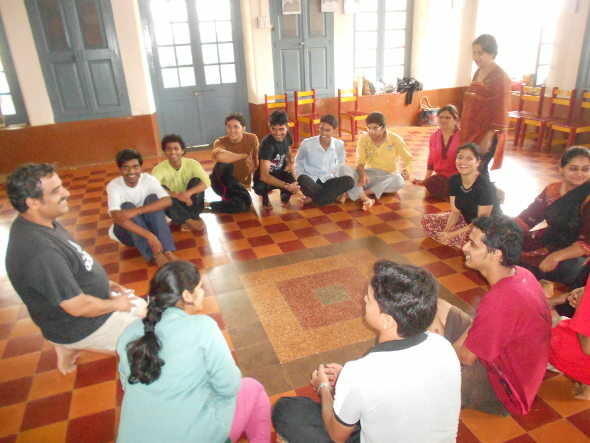 Recently in July 2012 Natyasutra arranged a workshop for Theater acting. This time Eminent, Multidimensional, Theater Personality Dr. Pradeep Vaidya was the Guru. Acting oriented workshops have been arranged for young talents to learn drama and dramatic Techniques. Almost 25-30 young armeture artists are the part of this eminent group.